Built on years of experiences in protein research, biological products/services development and commercialization, the mission of ProteinCT Biotechnologies LLC is to bring the research community a comprehensive set of high quality solutions for protein functional research, with a focus on the study of disease biology. In addition to technologies and products developed by ourselves, we will actively search, identify and validate unique, complementary and essential services and tools, and bring them to the researchers. We believe by maximizing the potential and availability of technologies developed for protein functional research, the community will be empowered to accelerate the discovery of disease causing mechanisms and to find cures faster. 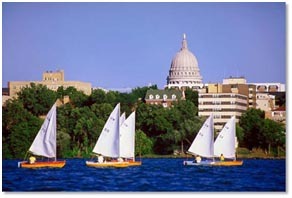 We are headquartered in Madison, WI, the place where many aspects of the foundation for modern day biology are discovered and developed: Genetic recombination in E. coli, the first synthesis of a gene, the discovery of reverse transcription - the paradigm shift for the central dogma of molecular biology. Madison is also a dynamic hub for biotech innovations, where the Cleland’s reagent dithiothreitol (DTT) was invented and the first human embryonic stem cell (SC) line was derived. Contact us today if you’d like to work with us on novel solutions to study protein function.